Ivory Coast – which way now? HomeNews in PerspectiveIvory Coast – which way now? February 2, 2014 Abdul Rashid Thomas News in Perspective Comments Off on Ivory Coast – which way now? Tensions are still high in the Ivory Coast, and political unrest is simmering at the edges, as the country’s economy struggles to make a comeback. Two regions, loyal to former president Gbagbo, responsible for a high percentage of the country’s cocoa production, are yet to accept his overthrow in 2011 by French troops and Ivorian rebels loyal to Alassane Ouattara . Supporters of Gbagbo are steadfastly holding back progress towards durable peace in Ivory Coast, whilst he remains incarcerated by the International Criminal Court (ICC), suggesting that Western political solutions to Africa’s complex political problems are unworkable. 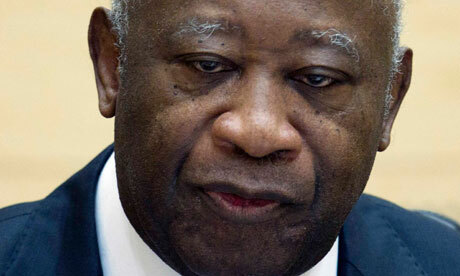 Ivory Coast’s opposition Ivorian Popular Front (FPI) is demanding the immediate release of Gbagbo. The former Ivorian leader has been held in custody at the Hague-based court for over two years. The ICC says it is gathering evidence against Mr. Gbagbo for his role in a civil war that followed his refusal to accept the October 2010 presidential vote. But although both Gbagbo and the current head of State – President Alassane Ouattara have been accused of human rights abuse, which took place during the bloody civil conflict, Gbagbo is behind bars, whilst Ouattara is said to be enjoying the fruits of injustice and impunity. Liberia’s border region is fast becoming a breeding ground for a deadly rebel movement. 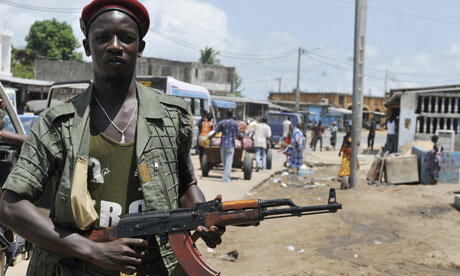 Is Ivory Coast poised for another civil war? Ivory Coast is the world’s biggest producer of cocoa. But without political resolution, based on a reconciliation package that is acceptable to all sides, the country will continue to slide into further economic decline and a bloody civil war. This could spell disaster for the West African sub-region, which after over fifty years of experimenting with self-rule, is still further away from finding the right formula for ‘democratic power sharing and representation’. Recent elections held in Ghana, Sierra Leone, Liberia, Guinea, Mali, and Nigeria, have all proved to be seriously controversial, prompting yet again another debate as to whether the ‘first past the post’ method of ‘democratic power sharing and representation’ is ideal for Africa. 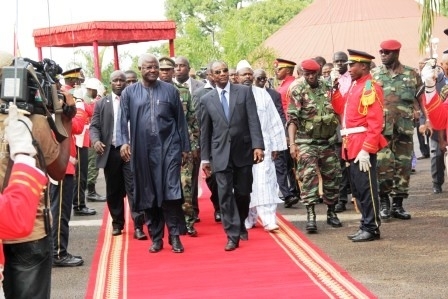 (Photo: Koroma of Sierra Leone meeting Conde of Guinea). Sierra Leone’s 2012 elections and the the country’s fourteen years fragile peace, were rescued by the international community and more importantly by an opposition SLPP that was willing and ready to pursue and accept due process. The country was at the edge of a precipice, which many believed could have sparked another civil war – far worse than Ivory Coast’s and Kenya’s conflicts – put together. Ivory Coast is still struggling to find peace and reconciliation following its 2010 elections debacle. Africans must now begin a grown up and honest constitutional discussion about ‘democratic power sharing and representation’, based on devolution and decentralisation – recognising the need for tribal and regional equality and diversity. In its latest report – ‘Côte d’Ivoire’s Great West: Key to Reconciliation’ (Africa Report N°21228 Jan 2014), the International Crisis Group re-examines the root of the conflict; assesses current realities on the ground and offers recommendations which fall far short of calling for the release of Gbagbo, as part of a sustainable and equitable political reconciliation package. Western Côte d’Ivoire’s land, security and identity problems make this vast border territory the country’s most unstable area. Reconciliation has yet to begin there and communal tensions remain acute. Two administrative regions are especially problematic: Cavally and Guémon. Outside Abidjan, these are the two regions where the post-electoral crisis claimed the most victims and which saw the gravest violence. The Ivorian government’s preference for a security clamp-down there, rather than measures to address political and economic problems has done little to address instability, which could provide the spark that reignites the crisis. Since December, the government has taken some steps nationally to lower political tension and promote national reconciliation: these should be immediately extended to these two regions, which remain strongholds of former President Laurent Gbagbo (Photo). Since independence, the central government has ignored Cavally and Guémon when distributing the nation’s wealth. These two outlying regions produce a significant proportion of the cocoa that makes Côte d’Ivoire the world’s biggest producer, as well as large quantities of other plant-derived raw materials. Yet they missed the “Ivorian miracle” and have remained undeveloped. Their exceptionally fertile land is both a source of wealth and their main problem. Poorly regulated and subject to fierce competition, land ownership is a recurring cause of conflict. Land is a magnet for migrants, both from other parts of the country and from abroad, who often outnumber those “native” to the area and leave them with a strong sense of dispossession. For a long time, conflicts have been resolved peacefully through local and customary dispute resolution systems. However, the economic crisis, demographic pressures and the spread of a xenophobic political discourse in the 1990s have exhausted these systems. Land conflicts, exploited by the three major political parties that disputed the succession to President Félix Houphouët-Boigny, have increasingly provoked violence between “native” landowners and migrants. The government of then-President Henri Konan Bédié tried in 1998 to resolve the situation by introducing a land code that was never enforced. The war in September 2002 and its aftermath then considerably worsened the conflicts. During this period, the violence that affected the west was worse than anywhere else in Côte d’Ivoire, bar the capital Abidjan, with large-scale criminality claiming dozens, even hundreds, of victims. This was partly due to Cavally’s and Guémon’s strategic location, not only because they produce cocoa but also because they are at the centre of the transport network that takes the raw material to the coast for export. Whoever controls these two regions also controls the country’s main source of foreign currency. Liberia’s proximity is another aggravating factor. Mercenaries from that country have exported the brutal behaviour that characterised the Mano River wars and make regular, deadly incursions into Ivorian territory, taking advantage of the weakness of Liberian and Ivorian armed forces. During the 2011 post-electoral crisis, further massacres took place in Cavally and Guémon. The gravest, with a death toll of hundreds in just a few days, took place in the town of Duékoué. Then, in July 2012, more than one year after the end of the crisis, other violent crimes were committed at the Nahibly camp for the internally displaced, just outside Duékoué. In 2013, several incursions into Côte d’Ivoire by Liberian and Ivorian militia from Liberia claimed further victims and displaced thousands. These recent events proved just how volatile these two regions are, and showed they are likely to be the first to boil over if political tensions increase. 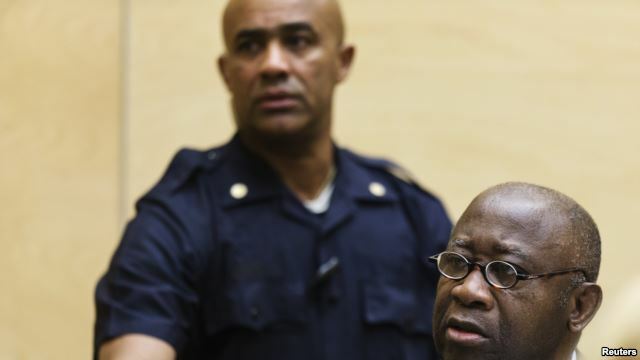 At the moment, serious crimes against members of ethnic groups considered to be supporters of former President Gbagbo remain unpunished, which lends credibility to allegations of a two-tiered justice system. 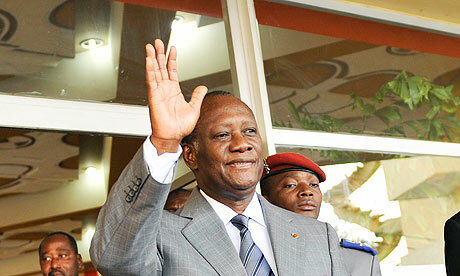 (Photo: Ouattara). The government in Abidjan must shed light on these crimes and take other significant measures to stabilise Cavally and Guémon. c) opening the communal graves discovered in March 2013 to establish whether they have any relation to the Nahibly massacre. 2. Clarify the legal status of the Dialogue, Truth and Reconciliation Commission; its mandate ended in September 2013 but its president is still active despite not being officially reappointed to that position. 3. Redefine, in the event of an extension to the commission’s mandate, the roles of the Dialogue, Truth and Reconciliation Commission and the National Social Cohesion Program in order to eliminate overlapping of the two bodies. 4. Provide the Ivorian judiciary with a complete copy of its internal report on the destruction of the Nahibly camp. 5. Expand the so-called legal clinics in Cavally and Guémon to improve access to justice in the two regions. c) restoring fully the functions of police officers and gendarmes, in particular their remit to conduct criminal investigations, and equipping them with the material resources necessary to proceed with these investigations, including vehicles, properly equipped offices and standard issue weapons, in order to rehabilitate the penal system. 7. Strengthen the military presence on the border with Côte d’Ivoire by establishing monitoring stations, especially during the dry season between December and June, when most attacks have been launched from Liberia over the last two years. c) restoring to the water and forest services the resources necessary to monitor protected national parks and forests after the reestablishment of the state’s authority over these areas and the clearance of illegal occupants; as well as making provision for the relocation of such illegal occupants. 9. Launch a special economic development plan for Cavally and Guémon in order to encourage non-agricultural activities and, in this way, lower the pressure on land. c) Opening forums for dialogue and meetings between communities and supporting local mediation initiatives by opening a permanent office in Duékoué.